Ants of India - Subscribe to alerts (RSS Feed)﻿Indexed in ISI Web of Science-Thomson Reuters (BIOSIS, Zoological Records, Biological Abstracts), Scopus, Elsevier, Google Scholar, CAB Abstracts,﻿ Pubget, EBSCO, Vifabio, BHL Citebank and other databases; Impact Factor by Thomson Reuters still computing; taxa published in Halteres are recorded in zoobank, Coverage in Elsevier product(s),﻿ Halteres on Facebook, Mendeley, in NAAS rated journals (2017 NAAS Rating 4.90), UGC approved "The journal provides an open access to papers and the journal allows the author(s) to hold the copyright and to retain publishing rights without restrictions﻿﻿"
"The journal provides an open access to papers and the journal allows the author(s) to hold the copyright and to retain publishing rights without restrictions﻿﻿"
Taxonomic studies on Eurydinotomorpha Girault (Hymenoptera: Pteromalidae) with the description of a new species from Western Ghats, Kerala (PDF) doi: 10.5281/zenodo.417293﻿ P. M. SureshanZoological Survey of India, Western Ghat Regional Centre, Kozhikode 673 006, Kerala, India. 1Department of Zoology and Environmental Sciences, Punjabi University, Patiala, Punjab, 147002, India. 2Department of Ecological Monitoring, Institute for Evolutionary Ecology, National Academy of Sciences of Ukraine, Kyiv, Ukraine, Academician Lebedev Str. 37, Kyiv, Ukraine, 03143. Zoological Survey of India, ‘M’ Block, New Alipore, Kolkata-700053, INDIA. 1Zoological Survey of India, Western Ghat Regional Centre (Recognised Research Centre of University of Calicut), PO Eranhipalam, Calicut-673006, Kerala, India. Zoological Survey of India, 'M' Block, New Alipore, Kolkata-700053, India. 1 Institute of Ecology and Environmental Sciences, UMR CNRS 7618, Université Pierre et Marie Curie, 7 quai Saint Bernard, 75005 Paris, France. 2 Department of Entomology, University of California, Riverside, CA 92521, USA. 3 Department of Forest Biology, Kasetsart University, 10900 Bangkok, Thailand. 1Haruyama-chô 1054-1, Kagoshima-shi, 899-2704 Japan. 2Sakura-chô 1-4-5, Sabae-shi, Fukui Pref., 916-0027 Japan. Raseena Farsana V. K., *P. M. Sureshan and Nikhil K.
Centre for Research in Medical Entomology (ICMR), 4-Sarojini Street, Chinna Chokkikulam Madurai 625002, T.N., India. Himender Bharti#and Silka Silla, Department of Zoology, Punjabi University, Patiala, India - 147002. Deen Mohamad Bhat1, R. C. Bhagat2and Ajaz A. Qureshi3, 1. Department of Zoology, Govt. Degree College Pulwama, Kashmir, J&K India-192301. (1email: din_ento@yahoo.co.in) 2 and 3. P. G. Deptt. of Zoology, University of Kashmir, Hazratbal Srinagar, J&K India-190006. Comparative study on improvement in Pollen Collection Technology (PDF) Shazia Raja#, Elizabeth Stephen Waghchoure, Rashid Mahmood, Ghulam Sarwar, Farida Iftikhar and Muhammad Sidddique Munawar (#e-mail: shazia_raja2002@ yahoo.com) Honeybee Research Intstitute, National Agricultural Research Centre, Islamabad, Pakistan. 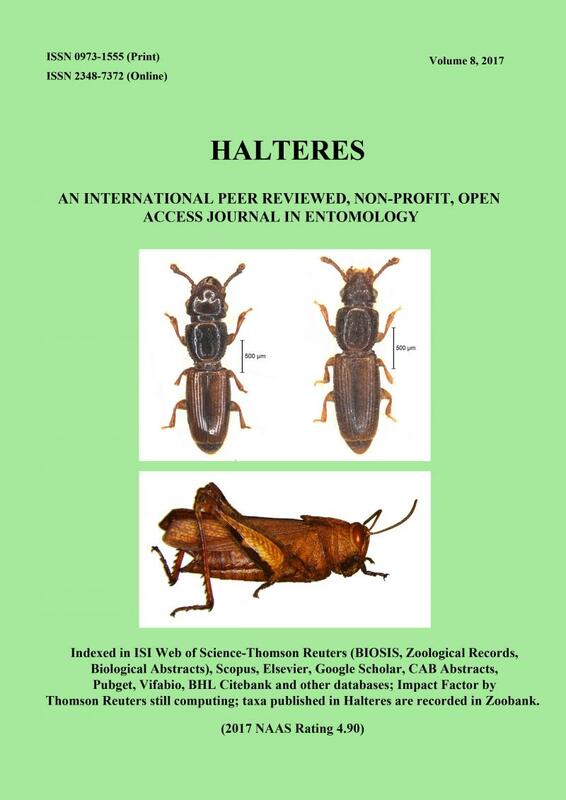 Biodiversity of the short horned grasshoppers of the tribe Oedipodini (Orthoptera: Acrididae: Acridinae) in Kashmir Himalayas (PDF) M. Nayyar Azim#, Shabir Ahmad Reshi and Ajaz Hassan Rather (#email: mnayyarazim@yahoo.com) Section of Entomology; P.G.Department of Zoology;University of Kashmir, Srinagar-190006 (J & K). Phylogenetic analysis of Indian species of genus Macrophya Dahlbom (Hymenoptera: Symphyta; Tenthredinidae: Tenthredininae) (PDF) M.S. Saini and L. Kaur 1email: saini20@hotmail.com) (2email: lakhwinderkaur.kaur@gmail.com) Department of Zoology, Punjabi University, Patiala, India. Lucilia calviceps Bezzi, new record from India (Diptera: Calliphoridae), with a revised key to Indian species (PDF) Meenakshi Bharti& Hiromu Kurahashi ((email: adubharti@yahoo.co.in) (email: MLB15110@nifty.com) Department of Zoology, Punjabi University, Patiala, (Pb.) 147002 India.International Department of Dipterology, Hikawadai 1-2-21, Higashikurume City, Tokyo 203-0004, Japan. Impact of egg retention on walking behavior of Trichogramma chilonis (Hymenoptera: Trichogrammatidae) (PDF) Muhammad Shakeel, Ahmed Zia, Abid Faridand Zakir Hussain (1. University of Agriculture, Peshawer. (email: shakeelkhanmarwat@yahoo.com) 2. National Insect Museum-NARC, Islamabad. (email: saiyedahmed@yahoo.com) 3. Nuclear Institute for Food and Agriculture (NIFA). (email: abidfarid@nifa.org.pk) 4. IPDM Laboratories Directorate of Agriculture Northern Areas-Gilgit. Role of honeybees and other insects in enhancing the yield of Brassica campestris var. sarson (PDF) J.S.Tara & Pooja Sharma (#email: puja80_sharma@yahoo.co.in) Department of Zoology, University of Jammu, Jammu (Tawi) 180006, J&K, India. Phylogenetic analysis of Indian species of genus Himalopsyche Banks (Trichoptera: Spicipalpia; Rhyacophilidae: Rhyacophilinae) (PDF) M.S. Saini and L. Kaur (1email: saini20@hotmail.com) (2email: lakhwinderkaur.kaur@gmail.com) Department of Zoology, Punjabi University, Patiala, India. Influence of foraging rate and speed of Apis species (Hymenoptera) on Brassica campestris var.sarson (PDF) J.S.Tara and Pooja Sharma (#email: puja80_sharma@yahoo.co.in) Department of Zoology, University of Jammu, Jammu (Tawi) 180006, J&K, India. SEM structure of mandibular sensilla in the carpenter ant, Camponotus compressus (Fabricius) (Formicidae: Hymenoptera) (PDF) Deepak D. Barsagade#, Dnyaneshwar B. Tembhare and Seema G. Kadu (#email: dr_ddbars @ rediffmail. com) Department of Zoology, RTM Nagpur University, Nagpur India-440033. A contribution towards the insect fauna of Vadodara, Gujarat (India): The Order Hemiptera (PDF) Dolly Kumar#and Bhumika Naidu (#email:dollymsu@gmail.com) Department of Zoology,Faculty of Science, The Maharaja Sayajirao University of Baroda,Vadodara-390002. Natural parasitism of leaf miner, Chromatomyia horticola (Goureau) (Diptera: Agromyzidae) on vegetable crops in Kashmir (India) (PDF) Deen Mohammad Bhat#and R. C. Bhagat (#email: din_ento@yahoo.co.in) Entomology Research Lab., P. G. Deptt. of Zoology, University of Kashmir,Hazratbal Srinagar, J&K India-190006. Bioecology of Til Hawk Moth, Acherontia styx Westwood (PDF) R.M. Ahirwar#and M.P. Gupta ((#e-mail: an.manoher@yahoo.com) Jawahar Lal Nehru Krishi Vishwavidyalaya, Department of Entomology,College of Agriculture, Tikamgarh-472 001 M.P., India. Diversity of the ground inhabiting ant fauna at Department of Atomic Energy campus, Kalpakkam (Tamil Nadu) (PDF) T. Ramesh2, K. Jahir Hussain1, M. Selvanayagam2 and K. K. Satpathy1 1. Environmental and Industrial Safety Section, Safety Group, Indira Gandhi Centre for Atomic Research, Kalpakkam-603102 (Tamil Nadu)2.Loyola Institute of Frontier Energy (LIFE), Loyola College, Chennai, India-600 034. Influence of Foraging time, Flight activity patterns and Duration of a foraging trip of Apis species (order: Hymenoptera) on Brassica campestris var. Sarson (PDF) J.S. Tara and Pooja Sharma Department of Zoology, University of Jammu, Jammu (J&K), India- 180 006. Biochemical changes in the midgut during metamorphosis in Apis cerana indica (PDF) Deepak D. Barsagade, Kalpana M. Kelwadkar and Mangala N. Kadwey Department of Zoology, Rashtrasant Tukadoji Maharaj Nagpur University, Nagpur, India-440033.